When I think about clamps, if I do at all, it’s in terms of holding wood steady in a scene shop while making sets for a play, or keeping two large objects that have been glued together tight while the glue dries. But there are many different purposes and applications for clamps, including in the medical field, demonstrated by the 3D printed cardioplegia clamps designed for King’s College Hospital Foundation Trust two years ago. Recently, a collaborative group of researchers from the University of Otago and the Auckland University of Technology in New Zealand and the University of Leipzig in Germany published a paper, titled “Utilization of 3D printing technology to facilitate and standardize soft tissue testing,” in the Scientific Reports journal that detailed their work in creating 3D printed clamps and fixtures that can help mount soft tissues for testing purposes. The abstract reads, “This report will describe our experience using 3D printed clamps to mount soft tissues from different anatomical regions. The feasibility and potential limitations of the technology will be discussed. Tissues were sourced in a fresh condition, including human skin, ligaments and tendons. Standardized clamps and fixtures were 3D printed and used to mount specimens. In quasi-static tensile tests combined with digital image correlation and fatigue trials we characterized the applicability of the clamping technique. Scanning electron microscopy was utilized to evaluate the specimens to assess the integrity of the extracellular matrix following the mechanical tests. 3D printed clamps showed no signs of clamping-related failure during the quasi-static tests, and intact extracellular matrix was found in the clamping area, at the transition clamping area and the central area from where the strain data was obtained. In the fatigue tests, material slippage was low, allowing for cyclic tests beyond 105 cycles. Comparison to other clamping techniques yields that 3D printed clamps ease and expedite specimen handling, are highly adaptable to specimen geometries and ideal for high-standardization and high-throughput experiments in soft tissue biomechanics. Soft tissues have several special characteristics, such as being diverse, directionally dependent (anistropic), and viscoelastic (exhibiting both viscous and elastic characteristics when undergoing deformation). The power of these qualities is increased by things like post-mortem delay, water content alterations, and traumatic pathology, all of which can cause issues when it comes to standardized mechanical tests of the tissue under strain. Over the last few years, the team developed a technique called partial plastination that uses ceramic-reinforced polyurethane resin at the clamp mounting sites to help with slippage. But it takes a long time to prepare this method, which also requires special (read expensive and hard to come by) equipment like casting fixtures and vacuum pumps, and errors can come up during the clamping due to how difficult it can be to position soft tissues in a test that involves the effects of gravity. Standardization in material testing and test setup. Focus of this study will be the boxes highlighted in red. During a quick Internet search, I found models of 3D printable clamps on Thingiverse, Instructables, and 3D Hubs, though none were for medical purposes. The research team’s clamping systems were designed using Creo 4.0 3D CAD software, and printed on an Ultimaker 3 Extended in commercially available ABS, PLA, nylon, and TPU filaments. In their paper, the research team described their experience mounting human soft tissues, from three different anatomical regions with differing properties, using 3D printed clamps, and also compared this new way of clamping to their previous partial plastination method. Co-authors of the paper are Mario Scholze, Aqeeda Singh, Pamela F. Lozano, Benjamin Ondruschka, Maziar Ramezani, Michael Werner, and Niels Hammer. Remove interstitials. Opt-in forms are a great way to generate leads for your business. But, you need to disable them from appearing on mobile devices because they disrupt the user experience. Most of the negative effects happen to your search rankings, so it’s best to find other ways to implement interstitials on your site. The post Five Reasons Why People Leave Your Website appeared first on GetResponse Blog - Online Marketing Tips. What’s an alligator without a tail? Still an alligator, and potentially dangerous, but a lot more stubby – which is how Mr. Stubbs the alligator got his name. 10 years ago, Mr. Stubbs was found in the wild missing his tail, and while rescuers are unsure how he lost it, they assume it was due to a fight with another gator. He wouldn’t survive long in the wild, being unable to swim or get to food as quickly as competitors, so he was taken to Phoenix Herpetological Society. However, he still struggled without a tail, so scientists at Midwestern University, upon hearing of his problem, decided to make him a prosthetic. In 2013, the scientists built a silicon prosthetic tail, but Mr. Stubbs outgrew it. Since he had doubled in size, the scientists didn’t want to risk getting close enough to take a plaster cast of his tail stump, so they decided to 3D scan him instead. The team 3D printed the model and used it to make a silicone cast. That cast was then used to make multiple prosthetic tails for Mr. Stubbs. Why didn’t they just 3D print a wearable prosthetic? While 3D printing has been used to create numerous prosthetics for animals, an alligator tail is especially large, and the team would have needed a large-scale 3D printer to print the prosthetic all in one piece. There are certainly 3D printers that could handle the job, but it would have been a time-consuming print, especially since they wanted to make multiple prosthetics. It would be easier to make one 3D print, use it to make a mold, and quickly cast several pieces. There’s also the fact that the team used silicone to make the tail. Silicone 3D printing only became possible two years ago, and silicone 3D printers still aren’t that common. Other animal prosthetics have been made from more common 3D printing materials like PLA or nylon – the latter lends itself well to the purpose in particular, thanks to its flexibility and toughness. 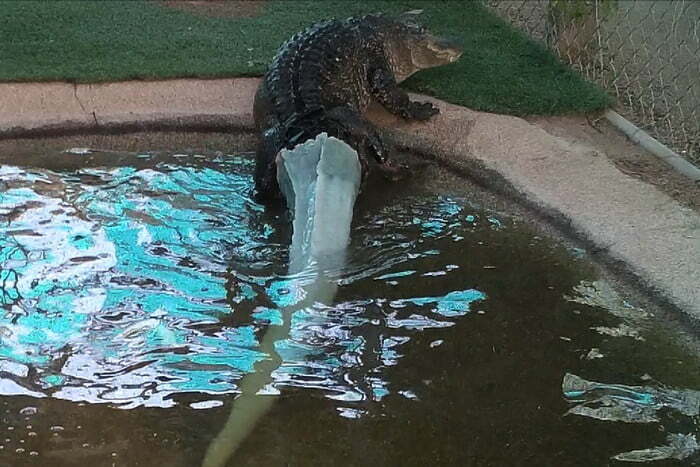 Silicone made the most sense for an alligator tail, however. With his new tails, Mr. Stubbs can swim and quickly get to food. You’ve likely needed to use lithium-ion batteries for at least one device at some point. They can be a pain to replace when they run out of juice, and though they typically last a long time, they don’t last forever. But a group of researchers at Carnegie Mellon University and Missouri University of Science and Technology have developed a method of 3D printing lithium-ion batteries which greatly improves their capacity and charge-discharge rates. The results are published in a paper entitled “3D printed hierarchically-porous microlattice electrode materials for exceptionally high specific capacity and areal capacity lithium ion batteries,” which you can access here. It has already been possible to 3D print porous electrodes for lithium-ion batteries, but the design of the 3D printed electrodes is limited to just a few possible architectures. The capacity of lithium-ion batteries can be greatly improved by creating pores and channels at the microscale in the electrodes. The internal geometry that has produced the best porous electrodes through 3D printing is called interdigitated geometry, which involves metal prongs interlocked like clasped fingers, with lithium moving back and forth between both sides. This geometry is not optimal, however. The research team, led by Carnegie Mellon Associate Professor of Mechanical Engineering Rahul Panat, has developed a new method of 3D printing lithium-ion battery electrodes. Their method creates a 3D microlattice structure with controlled porosity. Panat and fellow author Mohammad Sadeq Saleh have been studying the 3D printing of microlattice structures for some time now, and used a method of Aerosol Jet 3D printing that they developed themselves to create the porous microlattice architectures for the battery electrodes. The microlattice structure (Ag) used for the batteries’ electrodes improved battery performance in several ways, including a fourfold increase in specific capacity and a twofold increase in areal capacity when compared to a solid block (Ag) electrode. The electrodes were also incredibly robust, retaining their 3D lattice structures after 40 electrochemical cycles. The batteries can, therefore, have high capacity for the same weight or the same capacity for a greatly reduced weight, which is important for transportation applications. Before this, 3D printed batteries were created using extrusion-based 3D printing, which could create interdigitated structures but was not capable of fabricating the complex geometries that the research team’s Aerosol Jet method can manage. With their method, individual droplets can be quickly assembled one by one into 3D structures. This method has many implications for consumer electronics, medical devices, and aerospace. The researchers believe that the technology will be able to be translated to industrial applications in two to three years. Authors of the paper include Panat, Saleh, Jie Li and Jonghyun Park. Italian 3D printer company Wasproject is rather different than most firms. It has a stated goal of saving the world through 3D printing. Developing and selling 3D printers are to them just a way through which they can develop ever larger printers that solve ever bigger problems. The company wants to build buildings and entire villages using 3D printing. Today they showed us how to build a lovely structure in Milan. While 3D bioprinting is not yet able to fabricate full human organs just yet, it can be used to manufacture several different kinds of human tissue, such as heart and bile duct. One of the main barriers of forming viable tissues for clinical and scientific use is the development of vasculature for engineered tissue constructs, mainly due to generating branching channels in hydrogel constructs that can later produce vessel-like structures after being seeded with endothelial cells. But thanks to 3D bioprinting, it’s now possible to 3D print complex structures on multiple length scales within a single construct. This enables the generation of branching, interconnected vessel systems of small, vein-like microvessels and larger macrovessels, which couldn’t be done with former tissue engineering methods. However, the best sacrificial material for fabricating branching vascular conduits in constructs based in hydrogel has yet to be determined. A team of researchers from the University of Toronto recently published a paper, titled “Generating vascular channels within hydrogel constructs using an economical open-source 3D bioprinter and thermoreversible gels,” in the Bioprinting journal. Co-authors of the paper include Ross EB Fitzsimmons, Mark S. Aquilino, Jasmine Quigley, Oleg Chebotarev, Farhang Tarlan, and Craig A. Simmons. Existing 3D bioprinters have different technical advantages and deposition methods, which influence their prices and available applications. Extrusion-based 3D printers are good for tissue engineering, but the cost is usually too high for the field to experience significant growth. For this experiment, the researchers chose to create their own open source 3D bioprinter, which costs roughly $3,000 and can be used for lower resolution applications, such as 3D printing perfusable microvessels in tissue constructs. Both the chosen method and material have to meet a certain number of requirements to successfully 3D print complex branching vessel systems within hydrogel constructs. First, sacrificial materials, which need to be non-toxic and maintain a uniform filament diameter during printing, have to be deposited in the desired vascular design during printing, then flushed away once the construct is done. In addition, the 3D printer needs to have enough resolution to print all the channels – even those that will act as the small artery vessels of ~0.5–1 mm. It also needs to be able to deposit at least two materials, though more is better when it comes to creating heterogeneous tissues with different regions of varying cell and hydrogel composition. The team investigated formulations of gelatin and PF127 due to their potential advantages as sacrificial materials in hydrogel-based tissue constructs. Gelatin, which has been used in several biomedical applications, is a thermoreversible (the property of certain substances to be reversed when exposed to heat) biopolymer of several hydrolyzed collagen segments, and can be 3D printed at ~37 °C, which is a temperature compatible with cells. PF127 is a surfactant, meaning that it could have potential cytotoxic effects on embedded cells. But, it has inverse thermal gelation, which means it can be 3D printed at an ambient temperature, and then removed at ~4 °C to create void vascular channels. The team’s modular 3D bioprinter includes extruding systems, 3D printed out of ABS on a MakerBot 3D printer, which were designed specifically to hold commercially-available, sterile 10 mL syringes, instead of custom-made reservoirs that would need to be specially made and repeatedly sterilized. An open-source Duet v0.6 controller board controls the system, and the print heads are isolated from the XYZ movements executed by the lower part of the chassis. For testing purposes, water droplets were 3D printed in a defined pattern with each extruder system, and the average distance between the droplets’ centers in the X and Y directions were measured; then, the mean distances were compared to the pre-defined CAD model distances. “In conclusion, we found that PF127 is generally superior to gelatin as a sacrificial material for creating vascularized tissues by merit of its filament uniformity during printing and its greater compressive modulus,” the paper concluded. Hospital-acquired infections are a growing problem everywhere. The CDC calls them a “major, yet preventable threat to patient safety,” and the key to preventing them lies in keeping bacteria from spreading in a setting where bacteria is rampant. As 3D printing becomes more and more prevalent in the medical field, it is vital to make sure that 3D printed implants and tools do not play a role in spreading disease. Certain companies have been working on creating antibacterial 3D printing filament, and a group of researchers has conducted a study on bioactive filaments with antimicrobial and antifungal properties. You can access the paper, entitled Bioactive Potential of 3D-Printed Oleo-Gum-Resin Disks: B. papyrifera , C.myrrha , and S. benzoin Loading Nanooxides—TiO2 , P25, Cu2O, and MoO3, here. The researchers point out that bacteria have managed to develop resistance to many antibiotics, but that there are many natural antibiotics to which resistance has not yet been developed. They extracted oleo-gum-resins from benzoin, myrrha, and olibanum plants and combined some of them with 10% of metal nano oxide particles. 3D printer filament was created from the resins and metals, then 3D printed into disks which were subject to a number of tests. “Due to their intrinsic properties, disks containing resins in pure state mostly prevent surface-associated growth; meanwhile, disks loaded with 10% oxides prevent planktonic growth of microorganisms in the susceptibility assay,” the researchers explain. “The microscopy analysis showed that part of nanoparticles was encapsulated by the biopolymeric matrix of resins, in most cases remaining disorderly dispersed over the surface of resins. Thermal analysis shows that plant resins have peculiar characteristics, with a thermal behavior similar to commercial available semicrystalline polymers, although their structure consists of a mix of organic compoundsThe disks 3D printed from the natural materials, in most cases, inhibited the growth of the clinical pathogens being studied, and when nano oxide particles were added, the materials were even more effective. showed thermal behavior inherent to semicrystalline polymers such as polyester and polyurea; at some point, the molecules disposed in amorphous matrix obtain enough freedom of motion to spontaneously rearrange themselves into crystalline forms. This transition from amor-phous solid to crystalline solid was evidenced by distinct exothermic peaks, as the temperature increases to 500∘C samples, eventually reaching its melting point. In short this is a promising study. Polymeric behavior from these Oleo-Gum-Resin may make it easy to process them just as many other 3D printing materials. Furthermore, as 3D printing is being increasingly used to create things such as surgical instruments, surgical guides and implants, special consideration should be given to the materials that are used to 3D print these tools. Of course, all surgical instruments and implants are made to be sterile before being used, but what if they could be made from materials that actively prevented infection? There’s a big difference between tools that are free of pathogens and those that actively repel pathogens. Surgeries could be made safer and recoveries quicker, without the complications and extended hospital stays that happen when infections are acquired. 3D printing surgical tools from these materials will not eliminate all hospital-acquired infections; there are a number of causes for these diseases that go beyond surgeries themselves and threaten anyone who has to stay in a hospital. But if the use of these materials could cut down even a little bit on surgical complications, that would be progress. Authors of the paper include Diogo José Horst, Sergio Mazurek Tebcerhani, Evaldo Toniolo Kubaski, and Rogério de Almeida Vieira.